Lovely single level patio home near main entrance of Seven Lakes West. Open layout with hardwood floors throughout main living areas. Updated kitchen with quartz countertops, pantry and breakfast nook. Living room, dining room and Carolina room all with hardwoods and built-ins. 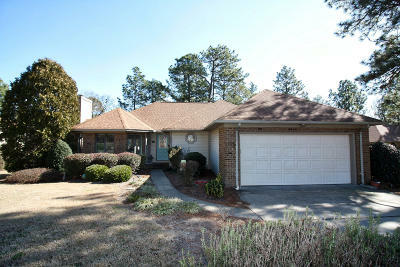 Large master has walk in closet, shower, jacuzzi tub and private commode room. Guest bedrooms have large closets. Lovely cul-de-sac location. Outside maintenance is included with townhome dues of $80/month--includes landscaping, gutter cleaning, trimming shrubs, blowing off walks and drives. Irrigation pumps from pond. All appliances convey. Roof 4-5 yrs old. Heat pump 3-4 yrs old. Neighborhood amenities include 800-acre Lake Auman, marina, pool, tennis and bball courts, community ctr! West End Schools.